Earn Stars where you shop. Buy groceries. Earn Stars. Go to the movies. Earn Stars. Then redeem Rewards easily from your favorite participating Starbucks® store. And there are so many ways to use Stars for Rewards. Get an extra shot or a pump of vanilla for just 25 Stars, your favorite drink with all the fixings for 150, or save up for select merchandise for 400 Stars. 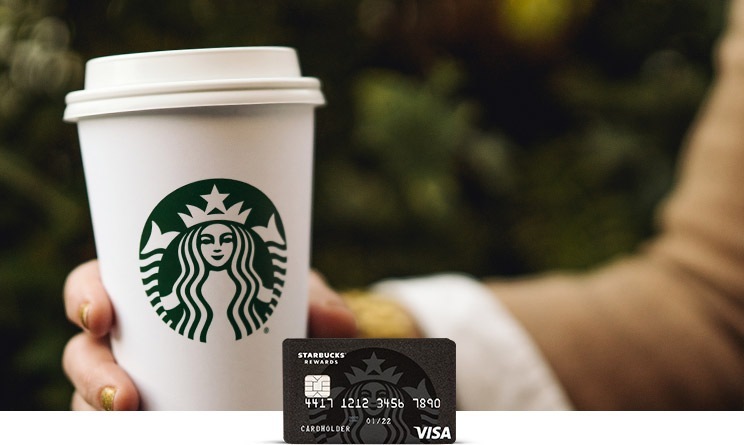 How you can earn Stars: You’ll earn Stars when you, or an authorized user, use a Starbucks® Rewards Visa® Card to make purchases of products and services, minus returns or refunds. Buying products and services with your card, in most cases, will count as a purchase; however, the following types of transactions won’t count and won’t earn Stars: balance transfers, cash advances and other cash-like transactions, lottery tickets, casino gaming chips, race track wagers or similar betting transactions, any checks that access your account, interest, unauthorized or fraudulent charges, and fees of any kind, including an annual fee, if applicable. 1 Star when loading funds to your Starbucks Card: You‘ll earn 1 Star for each $1 spent using the Starbucks Rewards Visa Card to load funds to your registered Starbucks Card through the Starbucks mobile app or at starbucks.com/card. 1 Star for each $2 spent: You‘ll also earn 1 Star for each $2 spent using the Starbucks Rewards Visa Card on purchases made in any of the following rewards categories: grocery stores; local transit/commuting; internet, cable, and phone services. 1 Star for each $4 spent on all other purchases: You‘ll earn 1 Star for each $4 spent using the Starbucks Rewards Visa Card on all other purchases, including funds loaded to your registered Starbucks Card at a Starbucks retail store. “Starbucks Card” means physical Starbucks branded stored value cards available for sale from participating Starbucks locations and other retail locations; digital forms of the physical cards available through the Starbucks mobile app; or Starbucks Card eGifts that can be purchased at starbucks.com/shop/card/egift and allow you to load a dollar value for use at participating Starbucks locations. The dollar value you load onto your Starbucks Card is a prepayment for the goods and services of participating Starbucks locations. “Participating Starbucks locations” means all Starbucks locations that honor Starbucks Rewards. For stores that honor Starbucks Rewards, locate a store at starbucks.com and look for stores that list “Digital Rewards” as one of their amenities. Information about earning/transferring Stars to Starbucks: Stars earned during a billing cycle will be automatically transferred to Starbucks after the end of each billing cycle. Star expiration: Under the Starbucks Rewards Program, Stars earned do not expire as long as your Starbucks® Rewards Visa® Credit Card account is open. If your Starbucks® Rewards Visa® Credit Card account is closed for any reason, your Stars will expire six (6) months after the calendar month in which your account was closed. Losing Stars: You’ll immediately lose all Stars that haven’t been transferred to Starbucks if your Starbucks Rewards Visa Card account status changes, or your Starbucks Rewards Visa Card account is closed for program misuse, fraudulent activities, failure to pay, bankruptcy, or other reasons described in the terms of the Rewards Program Agreement. Rewards Categories: Merchants who accept Visa/MasterCard credit cards are assigned a merchant code, which is determined by the merchant or its processor in accordance with Visa/MasterCard procedures based on the kinds of products and services they primarily sell. We group similar merchant codes into categories for purposes of making rewards offers to you. Please note: We make every effort to include all relevant merchant codes in our rewards categories. However, even though a merchant or some of the items that it sells may appear to fit within a rewards category, the merchant may not have a merchant code in that category. When this occurs, purchases with that merchant won’t qualify for rewards offers on purchases in that category. Purchases submitted by you, an authorized user, or the merchant through third-party payment accounts, mobile or wireless card readers, online or mobile digital wallets, or similar technology will not qualify in a rewards category if the technology is not set up to process the purchase in that rewards category. For more information about Chase rewards categories, see chase.com/RewardsCategoryFAQs. Each Barista Pick is available as a coupon automatically loaded to your Starbucks Rewards Visa account which may be redeemed for one (1) complimentary item at a participating Starbucks store as described in the terms of the applicable Barista Pick coupon. Substitutions and customizations are not allowed unless specifically permitted by the Barista Pick coupon. Barista Picks cannot be redeemed for cash or Stars. Each Barista Pick expires 30 days after it has been loaded onto your Starbucks Rewards Visa account. If you have provided us with a current, valid email address, you will receive an emailed notice that the Barista Pick has been loaded to your account. One Barista Pick will be loaded approximately once every six (6) weeks. Starbucks and the Starbucks logo are registered trademarks of the Starbucks Corporation. All rights reserved.